Daniel George focuses on individual characteristics, ensuring a personalized custom experience. What is the difference between a sports jacket and a blazer? A sports jacket is patterned and the blazer is a solid color, most often navy blue or black. A finer fabric such as gabardine or hopsack and interesting details like the ticket pocket, pic-stitching, functional button-holes and oyster buttons sets it apart from the ordinary blazer. Our collection of interesting herringbones, plaids, tweeds and gabardine are perfect to become your “go to” blazer. 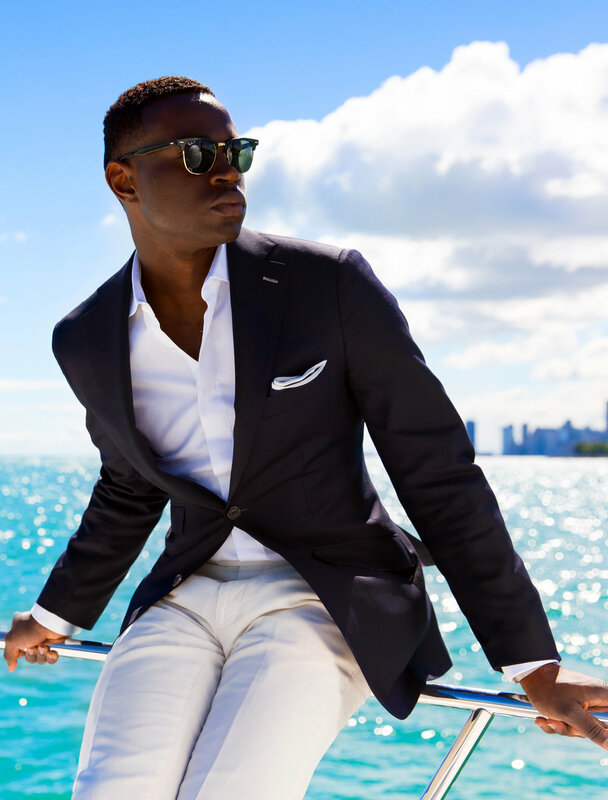 Discover the comfort and elegance of the casual sport coat. We offer a unique collection of fabrics specifically milled for a distinctive sports jacket, giving you the options ranging from heavier worsted wools and flannels, silks and linens, and a wide variety of year round woolens. The finished garment is one that looks great with a pair of gray flannel trousers or a pair of jeans. It features an unconstructed, natural shoulder with absolutely no padding, half lined or no lining in the shell, making the coat lightweight, perfect for evening when you need an extra layer.